So, it turns out the "gold standard" biopsy isn't always so golden. Maybe we should rename it the "old standard"? Also, this might make you think twice about cheating on the diet, even if you are "only" gluten sensitive. 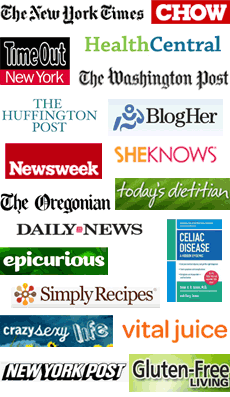 Interesting that only an estimated 5% of cases of celiac disease have been diagnosed in the US. ous neurological disorders and psychiatric problems. The study by Ludvigsson and colleagues reinforces the importance of celiac disease as a diagnosis that should be sought by physicians. It also suggests that more attention should be given to the lesser degrees of intestinal inflammation and gluten sensitivity. Another interesting point was that the incidence of celiac disease has increased 4 times in the last 50 years. This was concluded from stored serum samples, not from just the increase in current diagnosis. Adding fuel to my fire for my mom to get tested. I’m sure many of us deal with family members who show symptoms of celiac or gluten sensitivity but for whatever reason choose to ignore it. Hopefully this will help us to raise awareness just a bit more…. Thanks so much for posting that!!! I went for my biopsy a few months ago and was shocked to find out that I don’t have celiacs. I’ve got a sister with it and I also have an autoimmune thyroid disease. Ever since getting the biopsy results I’ve been wondering why I get sick when I eat gluten, I mean, could it be explained? No one has the answers and I find that really worrying. This study is really encouraging, it’s so hard to explain that I’m ‘only’ [huh!] gluten sensitive. I’m living G-free though, Yay for health!!! I have fructose malabsorption and recently finished a study involving people who follow a gluten free diet (for various reasons) but aren’t coeliac. I know that my illness means I can in fact eat gluten (it’s just wheat that’s the problem) but I met lots of people through the study who all seem to react to gluten and yet have a negative blood test. It’s definitely real, there’s just not much known about it. They’re continuing the study next year so maybe we’ll find something out! Phew! Yes, this sensitivity proof will hopefully help a lot of people. I’m glad you listened to your gut! 😉 BTW, I’ve met several people now with testimonials about how the gluten-free diet helped their thyroid issues. Some (with their Dr. monitoring ) have been able to lower their meds and/or end of completely off of them! Again, this is just from personal experiences shared with me. I’m not a Dr. and wouldn’t want you to do anything against a Dr.’s wishes. Just an FYI interesting thing to ponder/research. Melanie, were you one of the people studying this topic or were you being studied? I’d love more info or contact info for those studying this. Very interesting. Thx. I love this article ! Some many people in my life have gluten sensitivity and are in deep denial !One can live without bread and processed food. Gluten is the devil in my mind and we should all be gluten free. Being gluten free has changed my life in so many ways. gluten free restaurant gatherings? Thank you. Yes, my mom as well will not listen to me. I believe she has full blown Celiac disease, but of course I’m not sure as I’m not a health professional. That is exactly the problem, she won’t listen to me because I’m _not_ a physician. She is of a generation that only listens to doctors and her doctor most specifically. I was diagnosed with gluten sensitivity and have told her how much better I feel since going gluten free. thanks for bringing more awareness to the subject! Dear Chick, Thanks for sending the article from the NY Times. And this was on the Science Page? Quite the ‘filler’. It truly doesn’t even scratch the surface. I found out that I have Celiac (I’m 63) by having a follow up endoscopy after removal of a adenocarcinoma of the small bowel. A very rare cancer and mine was found at Stage II, with no other involvement. While I was researching this cancer, celiac kept popping up on data that I read, but no definite conclusions. I just past 6 months, cancer free and am committed to gluten free living. Anyone else have any cancer connection? Gluten sensitivity is greatly under suspect as the cause of my auto-immune disease (limited scleroderma w/CREST syndrome . . . we think). You may want to read “Dangerous Grains” by James Braly, MD,and Ron Hoggan,MA. If I understand the book correctly, this is what occurs: Protein in gluten is destructive to human tissue and the upper intestine. it will cause a condition known as leaky gut syndrome. The undigested gluten protein will leak into the bloodstream where white blood cells will attack it as a foreign invader. Our amazing immune system then creates memory cells in case this invader returns so that it can quickly take action again. Evidently, protein molecules look very similar whether animal or vegetable. At this point auto-immune problems occur as our white blood cells mistakenly confuse the proteins in our body’s tissue with the gluten protein and begin to attack the tissues in our bodies. Wow, this article cleared up a lot of confusion for me. I was recently diagnosed with IBS and told I likely have gluten/dairy sensitivities, but the doctor’s weren’t too clear on the best ways to go about reforming my diet or why these foods (particularly gluten) could be the cause. In the last few years I’ve suffered with anemic bouts, but never had any answers as to why. It always seemed to come and go and when I was tested, they always said I was “fine.” A little low, but everything was on the rise so I couldn’t be anemic. Who knew the food I was eating could be what was making me sick? Thanks! Had the blood test maybe 15 years ago, it came back negative. Still sick, IBS, fibromyalgia, osteoporosis, 87 pounds at my thinnest, gastroenterologist accused me of anorexia & bulimia. Four years ago had the genetic blood test. I have both markers. I believe if I had been diagnosed years earlier I would be healthier now. Listen to your gut! Hi How does one find walnuts and almonds that are not process with wheat. Really miss them. We are just taking our first holiday since my 2 children aged 7 and 10 were diagnosed. (I also think I have it but the tests keep showing negative). I have contacted the hotels we are staying at and they will try to help, if we take the following: GF cereals, GF soya sauce, GF bread and GF pasta. They can then make up a sauce from vegetables to have with plain rice, rice noodles or our GF pasta. I am still nervous but if the restaurant doesn’t seem to understand, we will just survive off of our own bread and snacks for a week!